We are selling our much loved 1999 Silverton 351 Sedan Bridge. Meticulously maintained inside, outside and mechanically. All the space you need to entertain lots of people very comfortably and sleep soundly. Sits 6 for dinner in the cockpit or dinette. All Brand New: Navy striped Bow cushions, Windshield cover, Navy Bridge enclosure, Helm cover, Elbows, Risers, Interior Carpet Covers, Smart TV in Salon, WIFI on-board enabled. SERIOUS INQUIRIES ONLY / NO BROKERS PLEASE. 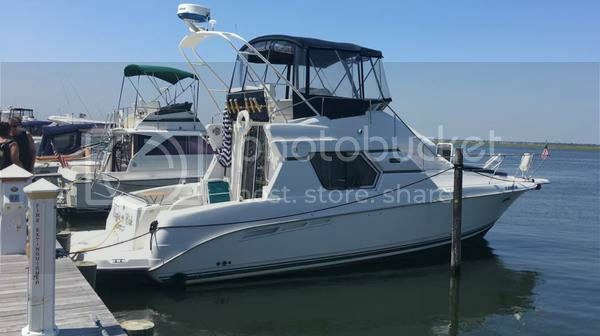 �	Length Overall (LOA) : 38'0"
The Silverton 351 Sedan Cruiser has Side Walk molded steps up to the flybridge for increased safety and security. Its large cockpit, wide open salon, and private stateroom can handle friends or the whole family. Katie, is vessel still available? W/B perfect for me. Sold my '93,37C two years ago & am not over it yet. If available; where located ? Hi Bob, I'm sorry, I didn't see this until now, but I sold the boat in early June. Good luck with your search, it's a great boat! !